According to Youtube data, 46% of U.S. consumers watch online travel videos when they're planning a trip. Looking for a way to stand out from the competition and attract people to your destination? 360 immersive video is delivering higher view counts, click through rates and completion rates than traditional videos and is quickly becoming one of the most popular ways to inspire audiences to travel. Our award-winning marketing team combines 360 immersive video creation with content-rich marketing strategies and one-stop print and digital to attract, capture and drive audiences to your destination. Targeted content marketing and online advertising, driving people to an online landing page highlighting your destination. Lead capture through a free goggle offer. Your target audience experiences a beautiful 360 immersive video of your destination. We’ll create and manage a full-service, digital drip marketing campaign to help drive and convert your new leads to buy tickets or room nights to your destination. 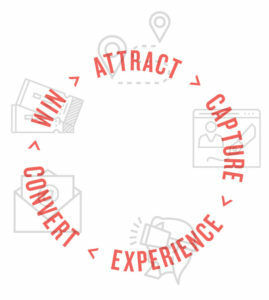 Your 360 immersive video and marketing campaign continues to find and inspire new visitors.